NIPPON GRAPHITE FIBER is leading manufacture of Pitch Based Carbon Fiber. Carbon Fiber is a fibrous carbon material made by Acrylic material or from oil/coal pitch and then by being given a heat treatment. Carbon fiber is light weight and higher stiffness than conventional metal materials. Apart from light and stiff, Pitch Based Carbon Fiber have other unique properties, low thermal expansion, high thermal conductivity, electrical conductivity and low friction. Carbon fiber is very thin fiber (10 micron in diameter). Pitch based carbon can be mixed with any type of plastic and elastomer as thermal conductive filler. The requirement of thermal management has been increasing from satellite to electronic device. Carbon fiber with 900W/mk is also produced industrially. And this property has been utilized for thermal solution in electronics and satellite application. 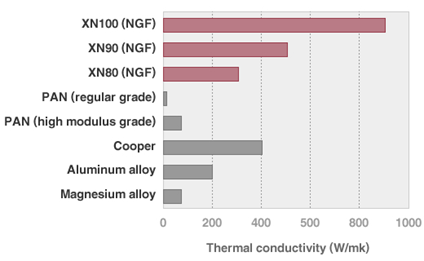 Thermal conductivity of GRANOC and other materials.